Facebook is the one of the biggest social networking platform or social media platform as well as important part of our life. Facebook helps to connect with our relative or friends always. Facebook is the best platform where we can share memories like photos, videos, status, thoughts, and lot of things which is promoted to ourselves. Here I solve your problem, how to create a facebook ad for advertising a business on Facebook. At present more than 1.4 billion people using Facebook and approx 900+ million visits daily, it is a huge amount of traffic on site which makes a second search engine of the world. Why we don't want to attract this audience towards our business...? Yes, we can attract this huge audience of facebook for business, but one question is that how we can use this audience for boost business? I am clearing your dought and introducing one of the best features of Facebook is Facebook Advertising. Here we will discuss how I can create a Facebook ad for advertising a business on Facebook to increase business opportunity. You know very well advertising on Facebook is paid, Facebook takes some amount to boost business towards the audience. Facebook offers a huge variety of paid ad option but we can be broken down into three parts. In Facebook paid Advertising section above three section is also divided into its subdomain like Campaign's subdomain is Objective. Advert set is divided into three parts like Audience, Placements, Budget & schedule, and Advert's subparts are page and post. These three options to help you to create Facebook Ads for your business. 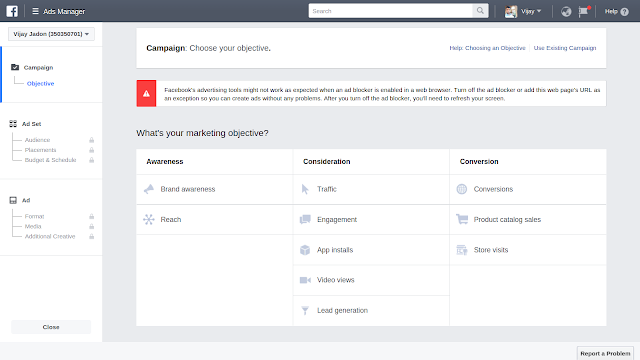 Generally, Facebook offers two tools for creating an ad - Ads Manager and second is Power Editor. Both are best but which one is suitable for you. You can run multiple ads at once. Normally Ads Manager best is popular more than Power Editor. With the help of Ads Manager, you can easily make an ad whereas Power Editor is hard to operate as compared to the first option. These options definitely boost your business in the digital world. You can track your Campaigns live with the help of two analytic tool one is Google analytic and second is Facebook Pixel which is an in-house analytical tool of Facebook. Compress your links with the help of Bitly or Google UTM source. These link compressor tools make easy to track your Facebook Ads activity on Google. How to Create Facebook Ads: A Step-by-Step Guide to Advertising on Facebook By Hubspot.